I cannot believe June has come and gone. It’s been one heck of a month. In cased you missed them, here’s a roundup of some of the best posts on Thirty-Seventh Avenue. What was your favorite? Most everyone I come in contact with when I tell them I’m an interior designer tells me how much they could use my help in their home. I laugh it off, until I actually get to their home and I think to myself yeah, they do need my help. Interior decorators have an eye for what looks good in a space. It’s part schooling and part instinct. We have the ability to see a room as a blank canvas and see it’s potential of what could be. What I love most about my job is the reveal. I design mostly hotel lobbies, and I love seeing real guests walk into a newly renovated lobby and say, “WOW!” That’s what I live for. You can’t buy that satisfaction. I recently fell in love with this living room and dining room design because it’s the formula of great design. 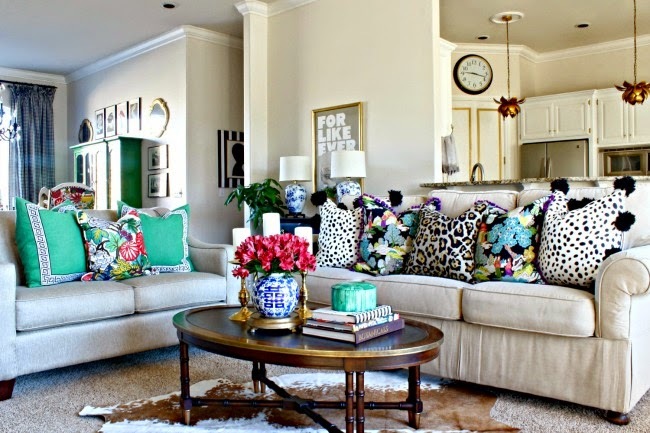 I love every bit of it from the leopard pillows to that vibrant pop of Kelly green. I’m dying to get my hands on my own property so I can decorate the way I really want to. You just feel so limitless in a rental. I already and drawn to navy and white, so this was just cherry on top. Jennifer, from Dimples and Tangles, is the owner of this gorgeous, funky space. You can deny it; this space is chic! 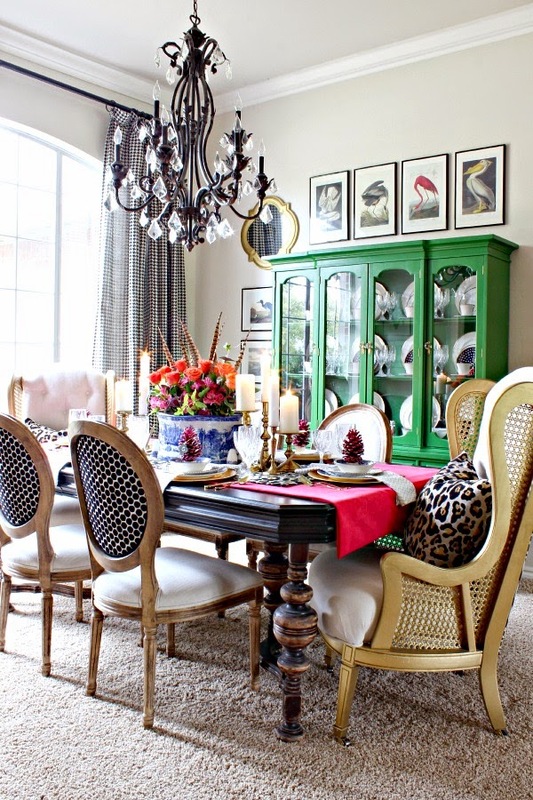 If you look at her entire house tour, you’ll see she loves playing with color. 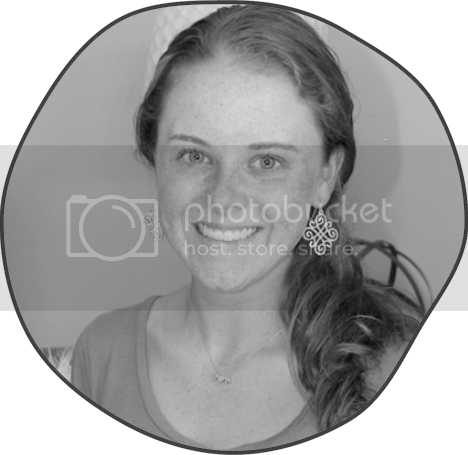 They are aspect of her home that I want to photocopy and purchase every bit and incorporate into my home. But what fun would that be? It’s no fun to copy exactly someone’s space, because then it isn’t yours. So, I wanted to break this design down and show you just how easy it is to use some of these elements to create a unique space of your own. PSA: You can create a space that is magazine worthy without hiring a designer. Whoops, did I just say that? I’m not trying to knock designers, because I myself am one. I’m not, however, a residential designer so I’m not worried about sharing my secrets. There’s nothing greater than the look of a space that has a designer touch, but there is a simple formula for totally transforming your space to the way you like it following someone else’s design. So what I’ve done is created a cheat sheet based off of the design scheme that’s going on in Jennifer’s home. No matter what color scheme you want, this cheat sheet will work the same way. Now, I have no clue what the paint colors, fabrics, etc. Jennifer used in her home actually are; this is simply a reproduction of the space if I were planning on doing in in someone’s home. First, you pick a neutral paint color for your walls. 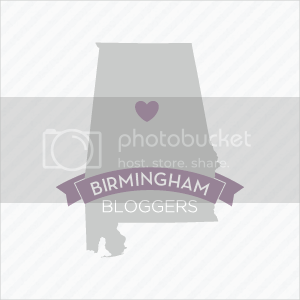 This particular shade is Benjamin Moore’s Revere Pewter, or better known as the Most Popular Paint Color Ever. Next, you need two accent paint colors. I chose BM Advance Kelly Green and Bold Blue. These are also going to act as accent colors throughout the space whether you actually paint something or not. 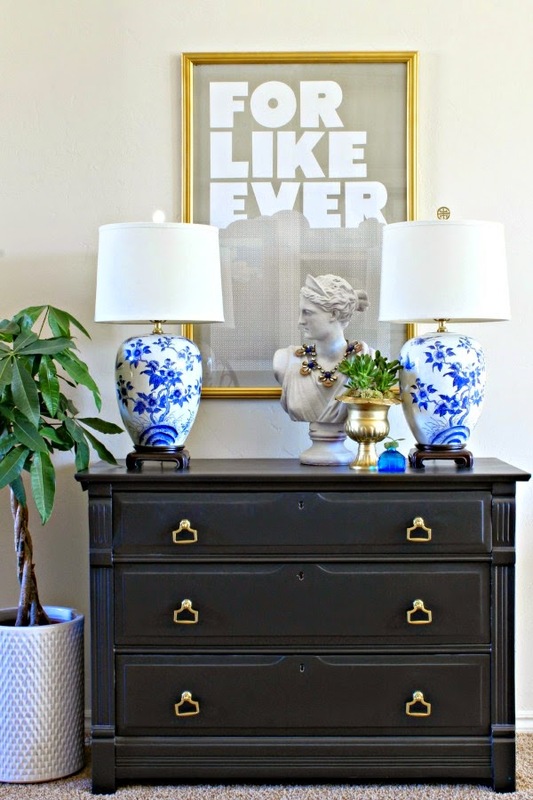 Jennifer painted the dresser in her foyer a deep navy blue and she threw a pair of green lamps on top. It’s dynamite! You’ll see these colors throughout her home. It’s okay to toss another color in like red or pink, but use in sparingly like in the table runner in the dining room. Pink is always a good idea! Then, you choose a timeless black and white pattern. Jennifer used polka dots in the dining room and bold stripes in a pair of lamps over the fireplace. She also has a little bit of this gorgeous Greek key outlined on a pair of pillows. Stay away from using these patterns in bright colors. Black and white is so classic and always looks great added in with any scheme. Next, choose three fabrics. Jennifer has a little more, but three is a great place to start for beginners. I chose a charcoal linen (for drapery or an ottoman) a white leather (for the sofa or lounge chair), and a fun leopard print (for accent pillows). Keep in mind, that your fabrics can be used for multiple pieces. When you feel comfortable with three, add in a brown leather and a couple of other fun pillow fabrics. Next, pick your metal. For I like to tell beginners to stick with one, because mixing metals is a great art. It can be done, but uniformity is easy and will guarantee a great look. Gold and silver are most popular but rose gold, bronze, and copper are also fun to use. After your metal, pick your wood finish. This is another hard one because designers are taught to play with multiple wood finishes. If you have a classic hardwood floor, try using a dark chocolate for furniture. If you have a darker hardwood floor, try painting your wood furniture white or light gray to brighten up the space. The main goal is to have a big enough contrast that your furniture will stand out. Jennifer has mostly carpet in her living spaces, so a darker wood looks better. And last but not least, play with other texture in your accessories. Baskets, hide rugs, exposed brick, and a little fur are great ways to bring in warmth to your space. 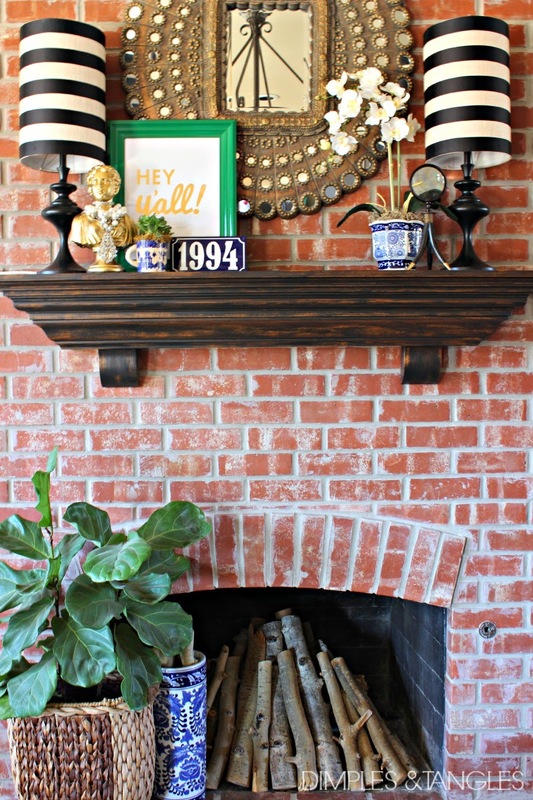 I love Jennifer’s exposed brick fireplace. A lot of people would think to paint it, but in her case it looks so great as it is. Jennifer also likes to accessorize, which isn’t a bad thing at all. Sometimes less is more, but in her case everything is arranged perfectly. Be careful when you are accessorizing that you don’t create clutter. I love creating little vignettes throughout my home. A mirrored tray with a small accent piece, a candle, and a vase with fresh flowers is my go-to. And there you have it. A perfectly designed space – every time. This is what I do when I am in the preliminary stages of any design. It’s never let me down. I’m eager to see this formula put to the test. If you try it out, please let me know and post pictures so I can see. If you’ve found you need a little more help, feel free to contact me. After all, this is what I get paid for! This Saturday I’m headed to Haleyville, AL to attend our annual family reunion with my loved ones. We always have a great time. Good Southern food, country music, cowboy boots and dancing. I’m a city girl, but I can’t help to but to love my back country roots. Here’s a few things I’ve found from the web this week that I love. I hope you all have a great weekend! I apologize in advance for any addictions that may form after reading this post. Proceed with caution. Sometimes you just have a case of the Mondays, amirite? Needy clients, the phone doesn’t stop ringing for a second, your inbox looks like you’ve been on vacation for three weeks, etcetera etcetera. The list goes on. When I have one of these days, all I want when I get home is ice cream and Netflix. But sometimes I’m so stinking tired that I come home and fall into my dog hair-covered sofa and beg my sweet and loving boyfriend to fix me an Affogato al Caffe. I just love to say that phrase. It’s so easy a caveman, ehr, my undomesticated, but so, so hot, boyfriend can do it. I first heard about this espresso-ice cream concoction from the one-and-only Martha Stewart Living magazine when I was in highschool (circa 2010-ish) and also around the time I starting trying different types of coffee. The Affogato al Caffe works as an after dinner drink and dessert and is both warm and cold all at the same time. It’s the definition of comfort food. Now, I’ve tried a lot of vanilla ice creams in my day, but the one I’ve found that works the best with this recipe is Edy’s Slow Churned Vanilla Bean. I love the vanilla bean and this particular brand is super creamy and rich. I used my Imusa espresso machine and Pilon ground espresso. However, my friend just gave me a bag of a Thiriku blend from Revelator Coffee Company based in Birmingham, so I tried it for this post. The smell alone will draw you in. I used my coffee grinder and made sure it was super fine. One to two scoops will do the trick. I started with my ice cream in a glass and then poured the hot espresso on top. You can stop here or add caramel or chocolate syrup for a more decadent flavor. The coffee will still be hot, obviously, so be cautious. I’m not responsible for any burnt tongues! A little bit of pink never hurt anybody! Pink is such a fabulous color. If you ask me, it’s a neutral color in my book! I love all shades of pink and I love decorating with it. I’ve been dying to redesign a lobby with a pink accent color, but my male clients aren’t too fond of that idea. I’m still working on it. Color trends change so frequently, so redecorating every time a new one comes around can be quite expensive. However, there are easy, budget-friendly ways to change up your décor as often as you’d like. If you’re trying to incorporate a pop of color into your home, you’ve clicked on the right link. Today I’m sharing my secrets to a tossing an unexpected color in a space. A great eye-catching color to play with? Pink! Flowers. 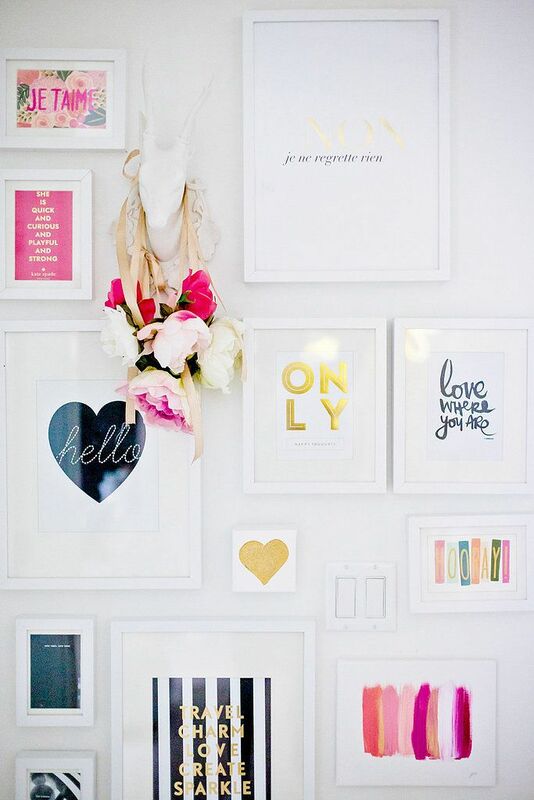 As you see in the photo above, floral arrangements are a great way to add a pop of color into your space. Fresh flowers bring a little life into your room, so I suggest treating yourself to them often. Pillows. 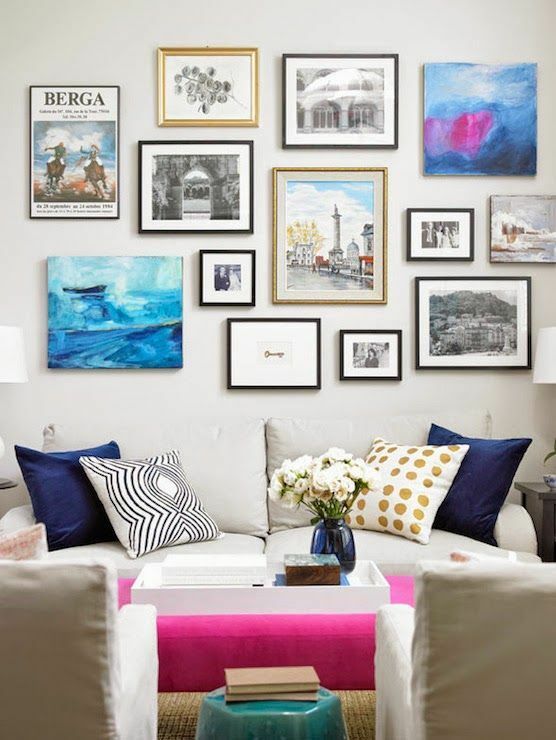 Ad you also see in the photo above, pillows are the easiest way to add a pop of color. Color trends change every year, so when you’re tired of one color recover them or toss ’em. Accent Pieces. An ottoman or another accent piece like a garden stool or console table is a perfect way to get than “wow” factor of a room. It’s unexpected and refreshing. Paint. Painting the inside of a bookshelf, the inside of an interior door trim, or the inside sides of dresser drawers can definitely be unexpected. There’s just enough color to make the room interesting. Artwork. Artwork is a excellent solution for drawing in color. 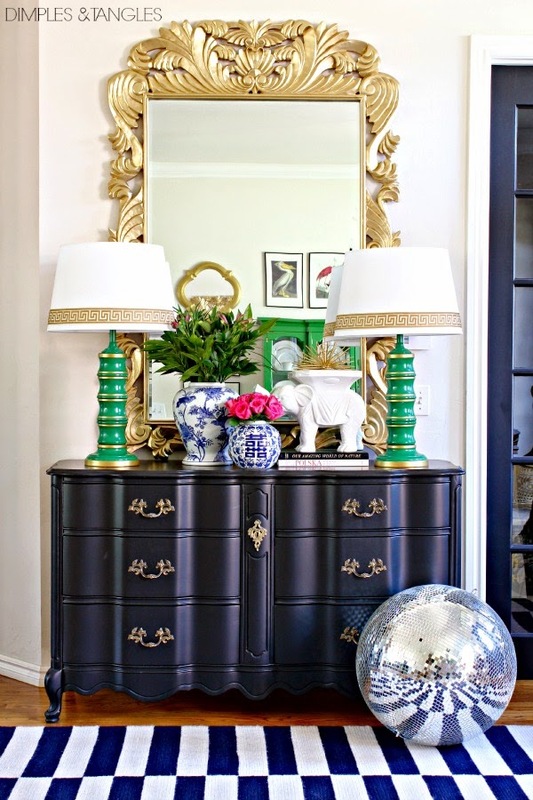 A black and white room immediately pops when you toss in a bright and fun shade. One piece is all it takes! Books. I love using the spines of color books as accent pieces. Color coordinate your books, or head to the thrift store and find a bunch of one color. Bonus tip: think contrast. If you’re buying a lot of pink books, make sure the bookcase is white or a lighter shade so the pink can stand out. How do you like to add in pops of color to your home? Handmade goods are great gifts for any occasion. They are a simple way to show you care and most people will love that you put a little sweat into it. (Literally, I did this at 7pm and it was around 85 degrees, so there was a lot of sweat that went into these!!!) Everyone loves the classic wooden spoon, so what better way to gift a set than to add a little flare to them with spray paint! This is the easiest, chicest DIY you’ll ever read. All it takes is a pack of wooden spoons ($3 at Walmart), a can of spray paint, old newspaper, and Scotch tape. And maybe an old pizza box. So basically just a bunch of stuff already lying around your house. I love all things gold so that’s the color that I chose. If I do this again, I would love to play with bright summery colors. Pink, orange and yellow would be too cute! I tore a sheet out of a magazine, that just so happened to be in Spanish, and taped it tightly around each spoon. If you have masking tape or blue painter’s tape you could skip this step. I sprayed one side, let it dry for about 20-30 minutes and then sprayed the other side. I may have also giggled a little because I just love gold spray paint. If you have a clear coat spray paint, I would suggest spraying it on top to keep the paint from rubbing/scraping off. But that’s it! Unwrap your beauties and admire them. I love the way they turned out! I was this close to adding glitter. It still seems like an excellent idea. If you try this DIY out for yourself, post pictures below so I can see them! I’m dying to see some neon pink ones! !